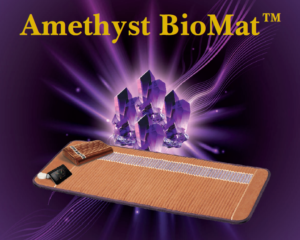 A typical session on the Amethyst BioMat is 30 minutes, allowing for a relaxing, peaceful and therapeutic experience. You can pick the temperature setting depending on the treatment desired. Most people see an immediate effect after the first use of the BioMat. Unlike heat from a heating pad, Far Infrared Light penetrates up to 8 inches into the body, which helps virtually all systems in the body function better. It transfers heat very efficiently, deeply penetrating to the cellular level to help reduce pain and speed healing of damaged tissues. A one degree increase in body temperature results in a 40% increase in immunity (Dr. N Yshimizu, MD, PhD). The BioMat produces negative ions on its surface when it is on. Negative Ions are natural energy on the molecular level. They enhance brain function, boost the immune system, help clear electromagnetic pollution (from cell phones, Wi-Fi, microwaves, etc. ), reduce allergy symptoms, alkalize the body and strengthen the cardiovascular system. For hundreds of years, amethyst has been known to help calm the mind and relieve anxiety. Amethyst emits negative ions (see above) and helps promote deep relaxation and sleep, balance the endocrine system and stabilize the nervous system. Amethyst produces far infrared rays which promotes healthy cell growth and regeneration.